The researchers state that it is normal for people to have "small size bacterial microcolonies" (of different kinds of bacteria) in the sinuses. The researchers theorized that the biofilms are probably "in equilibrium" under the influence of "inhibiting defensive factors of the body", but they can become a source of infection if there are favorable conditions (such as illness). In other words, the researchers said that these biofilms are more like "bacteria films" in that they contain bacteria, but they live in small colonies that don't cause an inflammatory response with sinusitis symptoms. One negative of this study was that advanced genetic sequencing was not done on the samples. Instead all samples taken from the people were cultured, which we now know misses a lot of bacterial and other microbial species (fungi, viruses). They looked at the microcolonies (biofilms) with scanning microscopes. Thus, while they found an assortment of bacteria on the sinuses of each person - they only found a total of 41 bacterial species among 30 persons. This is in contrast to studies using modern genetic sequencing that found hundreds of microbial species in healthy sinus microbiomes (microbial communities). The other issue is that it is not clear to me if there were biofilms or microcolonies that contained "beneficial" species in any of the samples. Other research suggests that biofilms of beneficial bacteria are also found in humans, and that this is one way beneficial bacteria that normally can't survive with exposure to oxygen can survive oxygen (the slime coating on the colony protects the bacteria within). The aim of this cross-sectional in vitro study was to evaluate the mucosal surfaces of healthy maxillary sinuses, explore different forms of bacterial microorganism colonies present on the mucous membrane, and determine a mucosal surface area they occupy. Samples of the maxillary sinus mucosa were collected from 30 healthy patients (M = 11; F = 19). The material was obtained during the Le Fort I osteotomy performed during corrective jaw surgery. 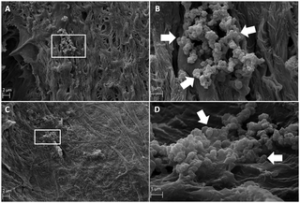 The morphological and morphometric analysis of sinus mucosa and bacterial film that was grown on it was performed using scanning electron microscopy (SEM) as well as imaging software. Scanning electron microscopy analysis showed the presence of different bacterium and bacteria-like structures in all the analyzed samples. In most cases, the bacterial film was mostly composed of diplococci-like and streptococci-like structures on the mucosa of the paranasal sinus. In any case, the mucous layer did not cover the whole lining of the evaluated sample. Each colony consists of more than 20 single bacterial cells, which has grown in aggregates. Under the conditions of normal homeostasis of the body, the maxillary sinuses present diverse bacterial colonization. The bacteria are dispersed or concentrated in single microcolonies of the biofilm on the border of the mucous covering the ciliary epithelium. There is no uniform layer of the biofilm covering the mucosa of the maxillary sinuses. Because the biofilm is detected on healthy individuals sinus mucosa, the clinical question if it may become pathogenic is unclear and require an explanation. It should also be noted that pathogenic organisms, such as Pseudomonas aeruginosa, Haemophilus influenzae, Streptococcus pneumoniae, or Staphylococcus aureus can be found in patients without active symptoms of the disease. Usually, colonization is defined as the presence of bacteria on the mucous membrane, and the lack of the inflammatory response distinguishes it from an infection. However, the bacteria film in contrast to typical biofilm might be defined by the presence of bacteria, that growth in colonies without inducing the inflammatory response. Thus, the aim of the study was to evaluate the mucosal surfaces of the healthy maxillary sinuses (without any history of recent acute sinus inflammations or chronic inflammation in the past), to identify different forms of bacterial microorganisms which could, under certain conditions, become opportunistic or pathogenic and determine a mucosal surface of the area they occupy. Scanning electron microscope investigations revealed the presence of bacterial film on the surface of maxillary sinus mucosa in 30 patients. Moreover, microbiological examinations of specimens taken from study participants revealed the presence of various types of aerobic and anaerobic bacteria in 28 cases (93.34%) out of 30 studied samples. All samples had mixed flora. In total, 41 different microorganisms were isolated. 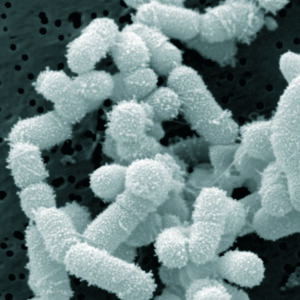 The most frequently found microorganism was Streptococcus spp. in over 90% of all samples, while Propionibacterium acnes were present in 29,2% of samples, and Staphylococcus spp. was present in 17% of the samples. Scanning electron microscopy analysis showed that the mucous layer has a thickness of 200 nm (± 40), which is covered up to 5% of the surface of each sample. The analysis showed the presence of bacteria-like microcolony structures in all analyzed samples.....Each colony consisted of more than 20 single bacterial cells, that had grown in aggregates. These clearly indicate the existence of a bacterial-like microcolony on maxillary sinus mucosa. Bacterial microcolonies on the maxillary sinus ciliary epithelium in healthy young individuals. Credit: Morawska-Kochman et al.